Firefighters safely removed three occupants sheltered on their third floor balcony while a fire burned a floor below this afternoon in Forestville. 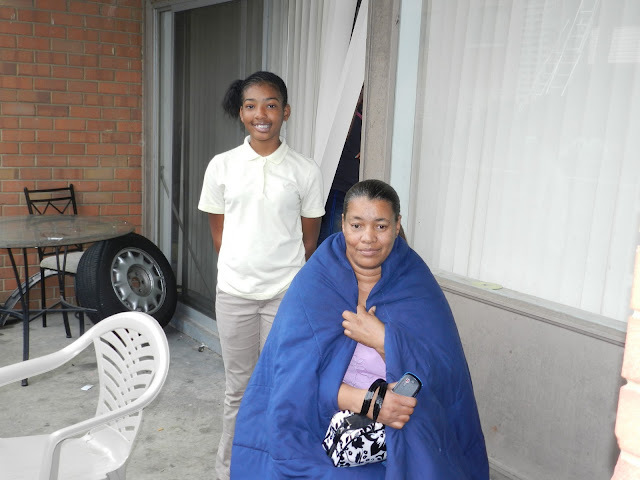 It was just before 2:00 pm, Thursday, October 27, when 12 year old Chyna Campbell thought she heard alarm bells ringing in the building behind hers. She looked out her balcony and saw people standing on the balcony of their top floor apartment in the building behind hers in obvious distress and screaming for help. The incident involved a 3-story garden style apartment building at 2718 Lorring Drive in the Doral Apartment complex. Chyna did what she had been taught to do by her parents while practicing what to do in an emergency. The young student from the Drew Freeman Middle School picked up the phone and called 911. She calmly described to the call taker what she was seeing and provided all the required information needed to dispatch firefighters and medics to the scene. 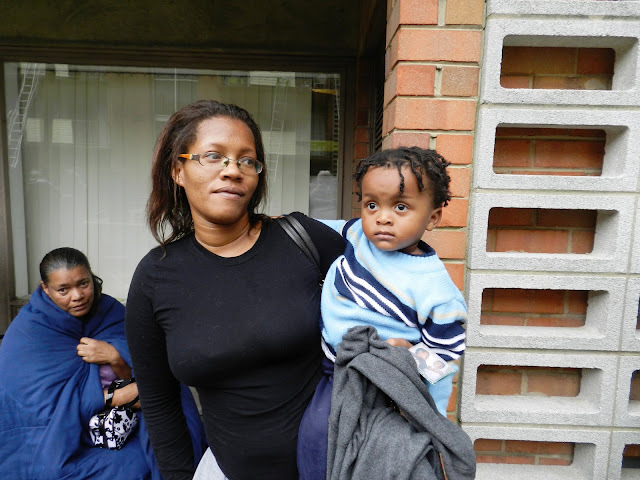 Firefighters were alerted, based on the information provided by Chyna, that occupants were trapped on their balcony. Rosemary, Nneka Elemihe and her 2-year-old son Aidan retreated to the safety of the balcony after finding the enclosed stairwell charged with smoke and heat making their primary means of egress unusable. After receiving as many details as possible about the fire, 911 call takers in turn gave instructions to Chyna about what to do and what to say to the trapped occupants and she did. She yelled out that the fire department was on the way and for everyone to stay outside of the building. Firefighters arrived quickly and immediately went to extinguish the fire and search for the occupants. 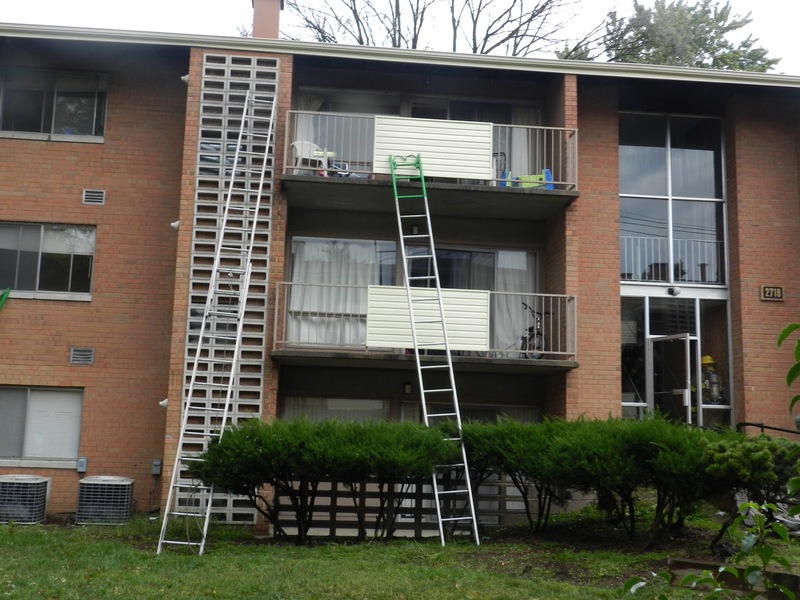 The first arriving engine crew from Seat Pleasant advanced hose lines into the building and firefighters from District Heights ascended a grounder ladder to the third floor exterior balcony and assisted the occupants safely to the ground. There were 35 firefighters, paramedics and incident commanders on the scene of this incident. 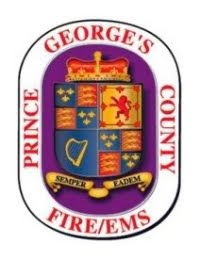 A kitchen fire was located in an apartment on the second floor. The fire was knocked down in about 10 minutes and contained to the apartment of origin. The cause of the fire is unattended cooking and fire loss is estimated at $20,000. No injuries were reported. Two apartments will be displaced from damages. This includes a total of 8 adults and 3 children. The County Citizen Services Unit and the American Red Cross will be providing assistance to those displaced. Copies of the 911 call made by Chyna Campbell are available by contacting Mark E. Brady at 240-508-7930.